Google's new +1 feature allows your visitors to instantly add their own seal of approval to your products. In essence, clicking on your site's +1 button allows shoppers to instantly bookmark your product pages in their Google Profile. More importantly, it also allows their acquaintances to also see the recommendations. "Sometimes it's easier to find exactly what you're looking for when someone you know already found it. Get recommendations for the things that interest you, right when you want them, in your search results. The next time you're trying to remember that bed and breakfast your buddy was raving about, or find a great charity to support, a +1 could help you out. Just make sure you're signed in to your Google Account." 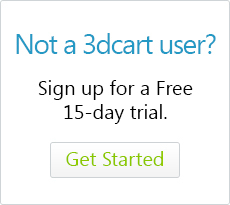 For 3dcart merchants, a +1 can help improve your search engine traffic performance and help drive more qualified shoppers to your site. 3. Click the "Save" button at the top right. The Google +1 button is basically a configurable widget, to which you can pass several parameters. The first of these parameters is size. This parameter can either be listed as "small," "medium," "standard," or "tall." In the following example, "standard" is being used. The next parameter we'd like to discuss, is the "count" parameter. This parameter tells Google whether or not you want to show the number of times a button has been clicked. In other words, the number of +1's the page or item has. This parameter may be true or false. Please note: If you're using the "tall" button, it will always include a count. In this example, we have the parameter set to "true"
You can also view other customization options on the Google +1 customization page located here. For more information, please visit Google's +1 landing page!